This debut thriller--the first in a trilogy from the late Stieg Larsson. Mikael Blomkvist, a once-respected financial journalist, watches his professional life rapidly crumble around him. Prospects appear bleak until an unexpected (and unsettling) offer to resurrect his name is extended by an old-school titan of Swedish industry. The catch--and there's always a catch--is that Blomkvist must first spend a year researching a mysterious disappearance that has remained unsolved for nearly four decades. 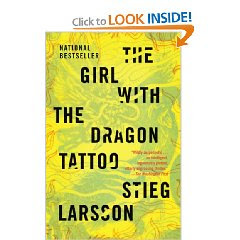 With few other options, he accepts and enlists the help of investigator Lisbeth Salander, a misunderstood genius with a cache of authority issues. Ordinarily, I'm not a fan of thrillers or many mysteries, but I've got to be honest - this was a riveting read. Though the pacing is a little slow to start with, once Larsson gets the ball rolling, the momentum is nearly breakneck fast. All of the characters are clearly multi-dimensional and incredibly smart, which sometimes isn't the case with this genre. Larsson even throws in a few red herrings and some creepy family drama as well. The story wraps up in a satisfying, but ultimately heartbreaking, conclusion. I can't wait to read The Girl Who Played with Fire next!